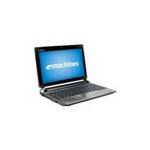 The eMachines EM250 sells for Rs. 15,000. That's a good price -- actually the most ideal price-point for a netbook in our opinion. But this low price is achieved by sacrificing the cost of a licensed copy of Windows. So, you'll either have to shell out more if you want Windows or use a freely available Linux OS on it. The EM250 is a decent netbook overall, except for the fact that you'll have to get used to the smaller keyboard. If you're going to do a lot of typing, then we'd rather recommend an HP mini 110 for around Rs. 3000 more. For Rs. 15,600, this netbook is surely very reasonable, no doubt about that. The CPU heavy tasks like encoding and watching HD video are not the hottest, but doesn't lag that far behind. The file system operations are swifter. Keyboard tactile feel is superb, but again the size could be a deterrent for some. Overall it’s a good looking piece too, which will do for those looking for a really cheap mini laptop that can hold its own.